Any self-respecting modder will at some point need to hack something on a grand scale. A group at MIT took the grand scale term quite literally, though, by turning a building into their playground. The MIT team turned the Green Building into a giant game of Tetris. 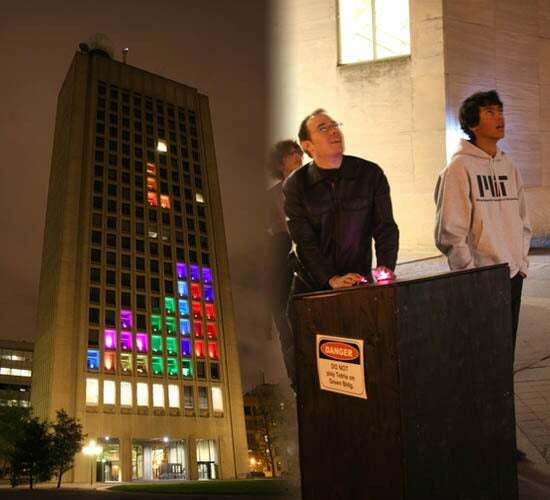 The building's 153 windows represent the drop zone and the Tetris blocks, fitted with lights all capable of glowing a variety of colors. What makes the mod particularly impressive is how all the window lights work together to produce the seamless falling, rotation and landing of each block. Each level gets progressively harder--the colors become more pale as you advance through the levels, which makes it harder to figure out where to place your blocks. While details on how hack is performed are scarce, what is apparent is you can play the game from a controller outside the building. Judging by previous attempts to light up the face of the Green Building, the team placed wireless LED lights in each window, which will respond to the controller platform. Check out the video below to see the hack in action on day two, and look on in awe. Spotted a couple of windows looking like normal office lights in the photo and video? This is because by the second day, a few of the windows stopped working.